Redirects are an essential part of SEO life and are useful in many numbers of ways. The 301 redirect, which tells search engines such as Google that content has moved permanently, is one of particular merit. This redirect method can help make site redesigns more seamless, help re-purpose old content, and even help to effectively ‘merge’ purchases of competitor domains. Blackhat SEO methods have shown that leveraging 301 redirects on expired domains can sometimes help squeeze out a little extra link juice—though bring an increased risk of penalty. There are less-scrupulous ways to use 301 redirects that bend the rules of what is considered to be Kosher SEO. These have been used for ages as go-to methods in black hat SEO playbooks, but have largely lost their appeal with the ever-increasing intelligence of Google’s search algorithm. 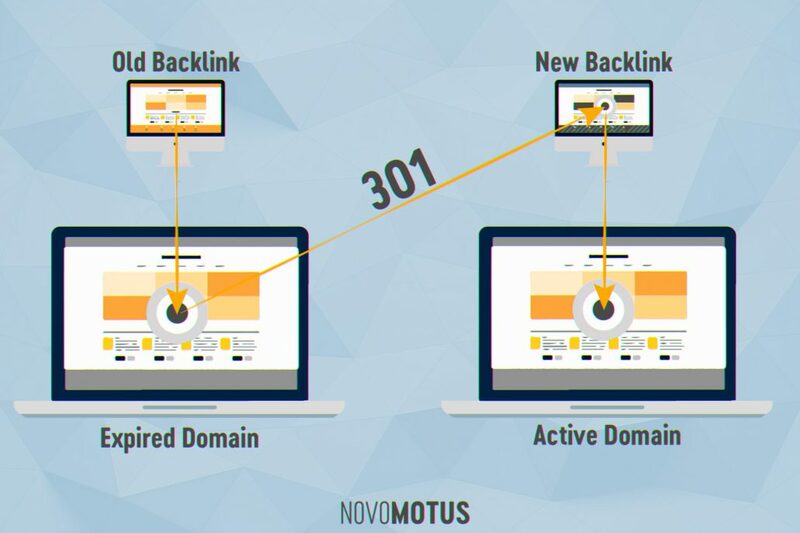 Years ago, if you found an expired domain that had 1000 solid backlinks, you could simply add a registrar-level 301 to a website a reap the benefits! There are virtually zero occasions in which this would be advisable any more, however, though some selective 301 methods still have some merit. NOTE: We’d like to make it abundantly clear that the rest of this article will discuss a method of backlinking that could result in a penalty, negative SEO value, and/or manual action being taken against your website. Expired domains are hot commodities because they are effectively like buying links at a drastically discounted price. An expired domain with 10,000 backlinks sells for the same price as a brand new domain with no backlinks—registration fee only! Re-registering these once-active domains allows leveraging of former backlink equity, though not nearly as much now as in the past. Expired domains are popular among those who utilize private blog networks (PBN) as cheap sources of powerful backlinks. It’s generally regarded that the interim period of de-registration is enough for Google to recognize it being practical to ignore all past backlinks, and only consider future links when considering overall rankings. This isn’t completely agreed upon, however, and sometimes leveraging the backlinks of expired domains can offer some SEO benefit when a little creativity is applied. Just because a domain name expires doesn’t mean that all the backlinks pointing to that website disappear overnight. Links from large authority sites like CNN or The Huffington Post can remain live almost indefinitely. When you re-register an expired domain, you then have control over where the referrals and link juice from those historical backlinks links flow. This can be useful to redirect links to relevant content on other sites you are working on, other supporting content, or to re-purpose the site as a PBN node. Again, it’s our perspective that expired domains do not serve well as PBN sites anymore—though we have seen stranger things happen. A more practical use of this would be to send redirects to articles that you have contributed to other major websites on behalf of clients, especially if it’s on the same website as the redirecting link. To better illustrate how this method can be put into play, consider the following example. You have a website for which you have been investing heavily in editorial outreach to get powerful authority backlinks from top news sites in your industry. These links carry powerful domain authority (DA) behind them, but not always a tremendous amount of page authority (PA). Let’s say your website is for car restoration services, and one of your most-recent articles was a how-to piece on removing rust from chrome. If you can find an expired domain with even remotely similar content (think ‘cars’, ‘transportation’, ‘hobbies’, etc.) that also has some powerful backlinks, you can boost the page authority of your newly-contributed article with some simple 301 redirects. To do this, you’d need only have the expired domain hosted, former linked content identified, and then put in place some 301 redirects for the specific content that has the backlinks you want that point to your contributor article. This method effectively siphons the link juice from the expired domain’s top content into the page authority of any of your newer, more relevant links. A riskier approach of this method would be to point the 301 redirect directly towards the website you are trying to rank, though few occasions are seen where this would be advisable. When dealing with 301 redirects from expired domains, there are a few different approaches you can take. The first approach is a simple domain level 301 which would redirect any active referrals and whatever salvaged link equity that may still exist to your target site. The benefit of this approach is that it can be done at the registrar level, and only requires a yearly domain registration fee. The second approach is to only redirect requests for an expired domain’s top content to your target site. This method requires an extensive backlink audit with a tool such as Ahrefs or SEOSpyglass and the hosting of your website on a server where you are able to control redirects. Knowing which articles have the most link equity can allow you to isolate them by context to redirect them to content that’s actually related. One short-coming of this approach is that if there were to be multiple links coming from the authority-domain source to the expired domain, they would all get 301 redirects. This could also effectively be done through a CMS like WordPress by using redirection plugins such as Redirection, which has referrer-based detection. This would involve more effort (actually building a website) but would look much more natural and leave much less of a footprint in the perspective of those sites not being redirected—unless you were to simply redirect all other referrers to another address. Again, let us stress that referrer-based redirections are like playing with fire and easily flagged by search engine crawlers such as Google. For example, if GoogleBot were to come to your expired redirection page from domain-a and be shown different content than when it came from domain-b, that’s a red flag. If you have in place user-agent detection for GoogleBot to handle that issue, then you’ll be referring all the backlinks to the target site in GoogleBot’s eyes, effectively nulling your entire approach. We find very few circumstances in which this method is able to be applied, though when applied correctly it can offer a very cost-effective SEO boost. 301 redirects are a necessity of modern SEO and are ‘white hat’ in many applications. With a little creative imagination, however, these types of server manipulations can be used to leverage the power of expired domains in a very unique manner. We refer to this method as Selective Expired Domain Redirects though only rarely find a situation in which the benefits of using it outweigh the risks. When the opportunity arises, however, expired domain 301 redirects controlled on a referrer level, on a per-article basis can offer powerful SEO boosting control. For consideration of potentially being flagged as in violation of Google’s Webmaster Guidelines, we generally only ever use these types of redirects to boost supporting content for our project sites such as Web 2.0 backlinks or guest posts. In this application, they add a bit of extra link juice to the quality backlinks we’ve worked hard to establish but don’t point any risk to our main project website. Sometimes bending the rules like this can help you get an edge when facing competition from much more authoritative domains.